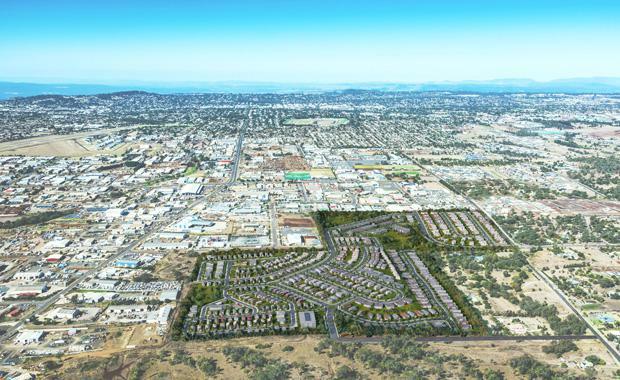 The largest approved residential development site in Toowoomba, spanning 42 hectares, is being offered for sale exclusively by Colliers International. In December last year, Hodge Holdings won the right to develop the land into an outstanding mixed use development with potential for over 600 dwellings. Approvals are already in place for the first 79 residential allotments as well as a master plan approval for residential, retirement, aged care and manufactured housing development on the remaining land. Brendan Hogan and Chris O’Driscoll of Colliers International are marketing the significant land holding through an Expressions of Interest campaign closing Wednesday 20 July. Mr Hogan said: “This opportunity is ideally positioned for developers and investors seeking a strategic holding in one of Australia’s fastest growing regions with approvals already in place. The property is located in the heart of the growth corridor stretching from Toowoomba’s CBD to the new $300 million Brisbane West Wellcamp Airport. “Multiple hospitals and major retail centres are in close proximity, including Clifford Gardens, which was recently purchased by Blackstone for near to $200 million. The proposed Glenvale Shopping Centre is also within walking distance of the site and is further supported by a new Coles supermarket that is within a short drive of the property,” Mr Hogan said. “Toowoomba is Australia’s second largest inland city to the nation’s capital Canberra and is set for substantial growth with the population forecast to increase 37% by 2036 according to ABS. The Urban Developer is proud to partner with Colliers International to deliver this article to you. In doing so, we can continue to publish our free daily news, information, insights and opinion to you, our valued readers.